Delicious, simple and healthy recipes from skilled cooks and dietitians. Mother’s Day is just around the corner (11th March)! If you’re looking for the perfect way to celebrate, follow our guide and surprise mum with these simple yet truly scrumptious recipes. From breakfast-in-bed to a one-pot roast dinner, these meals are guaranteed to put a smile on her face. Mums love nothing more than getting the whole family together, but they’re often the one rushing around making sure everybody is happy and well fed. So this Mother’s Day, give her a well-deserved day off – we guarantee that she’ll appreciate it! The below recipes are surprisingly easy to make, yet packed full of flavour. The breakfast recipe takes under 30 minutes to make and dinner consists of a lovely one-pot roast which is ready in just 45 minutes. All finished off with a dessert fit for a queen. In addition to great taste, each recipe uses whole grains, which are a great way of getting some fibre – an important part of a healthy, well-balanced diet. Let us know your plans for Mother’s Day (and if you’re going to try these recipes) over on our Facebook page. We’d love to hear from you! 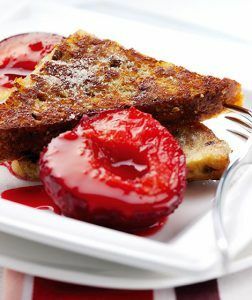 This French toast recipe is the perfect breakfast treat… after all, if you can’t treat your mum on Mother’s Day, when can you? If plums aren’t your thing, switch them out for fresh apricots or apples. Not really a fan of cooking? 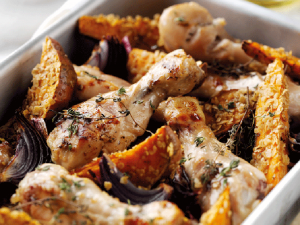 Our effortless chicken and sweet potato roast is bound to impress her. Plus, there’s only one pot to wash afterwards! What’s not to love? 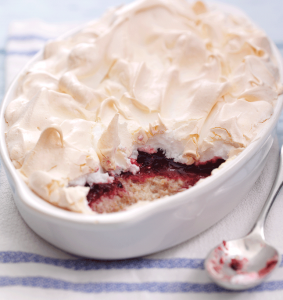 Finish off the day by treating your mum like royalty with our Queen of Puddings dessert. This delightful recipe only takes 10 minutes to prepare! Whilst it’s cooking in the oven for an hour, sit back, relax and let that roast dinner settle. Sign-up for our news alerts! Never miss the latest exciting recipes, free booklets, competitions or useful articles. We promise not to bombard you and it’s easy to unsubscribe if you change your mind. Welcome to Whole Grain Goodness, an independent, not-for-profit campaign by AHDB Cereals & Oilseeds.